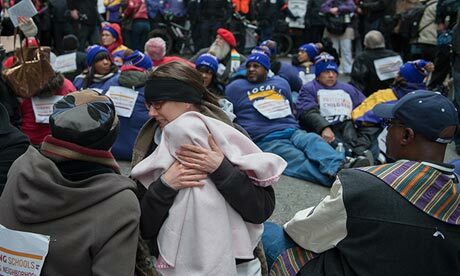 This article by Gary Younge is re-posted from The Guardian. 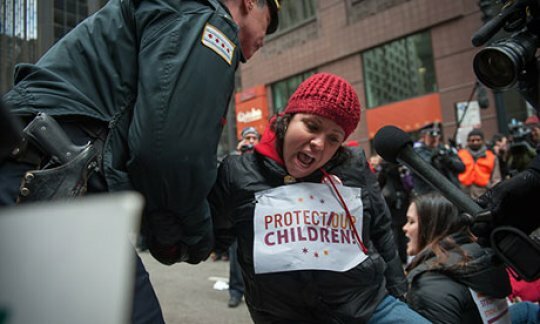 More than 100 demonstrators taking part in mass civil disobedience were arrested in Chicago on Wednesday as several thousand people marched against the largest proposed round of school closings in recent memory. Many carried placards proclaiming “Strong Schools, Strong Neighbourhoods” and “Protect Our Children” while chanting “Whose Schools, Our Schools” and calling for mayor Rahm Emmanuel’s resignation. The city last week announced plans to close 54 schools affecting more than 30,000 students, primarily in low-income black and Latino areas. The proposals – which had already sparked huge, rowdy protests at hearings throughout the city prior to the announcement – mark Emmanuel’s second major confrontation over education in less than six months following the teachers’ strike in late August. Chicago Public Schools claims the closings are necessary to plug a $1bn deficit in the third-largest school district in the city and that consolidating under-utilised and under-performing schools will save $560m over 10 years by reducing investment in shuttered buildings. The district insists the savings will go to improving classroom resources including air conditioning, libraries and iPads for all students in grades 3-8. Roughly 100 schools in Chicago – the third-largest school district in the country and with 87% of students from low-income families – have already been closed since 2001. Eighty eight per cent of the students affected in those closings were black, even though black students comprise just over 40% of the city’s student body as a whole. Community groups, unions and many parents argue that the closings will devastate already struggling areas, raise student-teacher ratios, put children in danger by forcing them to cross gang lines to go to new schools and are based on flawed calculations and savings. Opponents point out that there is little evidence that school closings achieve that aim and claim the closings mark an acceleration of the city’s bid to “privatise” education by forcing students into charter schools. “In the same time these school closings have been taking place over the past decade, the city has opened about 100 charter schools in the very neighbourhoods where they’re now closing schools through under-utilisation,” said Sharkey. “Meanwhile supports of charter schools have been very open ideologically about making school competition part of the larger picture. A study by the University of Chicago’s Consortium on Chicago School Research revealed that from the 38 schools closed between 2001 and 2006 only 6% of students who were moved went to high-performing schools.